One question that remains is exactly when the program that automatically permuted phrases was written by Ian Sommerville in collaboration with Brion Gysin. I’m very interested in finding this out, but I do have other projects that are keeping me from doing archival or even deep library research into this. After discussion on the original announcement post, I’ve made a few corrections to this sort of metadata, but I still can’t figure out when this permutation code was first written. And since I don’t know which texts are the first examples of output from these programs, I also can’t tell how the permutations were ordered by the program. The poem “KICK THAT HABIT MAN” was written manually in 1959 and other permutation poems were broadcast by the BBC in 1960. “Around 1960” is sometimes given as a date for the program or programs. 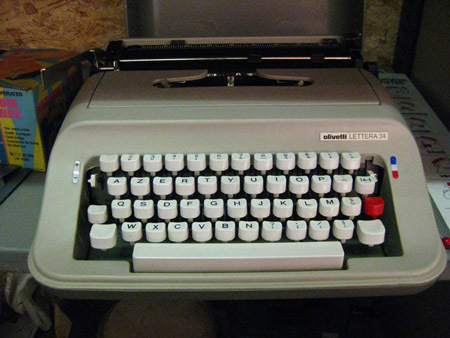 However the Honeywell Series 200 Model 120, indicated in several places as the computer used, was not released until 1965. Please let me know if you know that a different computer was used or if you know the exact year in which the permutation poem programs were written. My most unconventional lab is documented in a new zine by Sherri Wasserman, one available for download and screen-viewing now; it will be available in DIY print-and-bind-your-own format soon. The publication is Restore [Return] Shift, and it’s the second in a series of zines documenting spaces that preserve and offer access to creative computing. A rare color photo can be seen on the Instragram announcement. The Computer Museum is … Alive! A great story on the Living Computer Museum in Seattle, where they have computers … that work! Principles for organizing a laboratory with material computing resources are articulated. 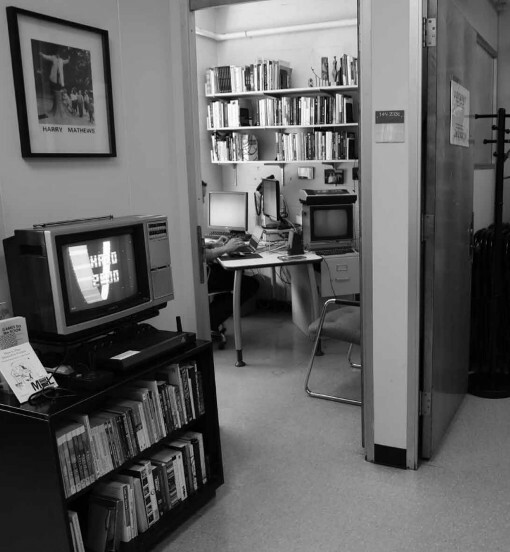 This laboratory, the Trope Tank, is a facility for teaching, research, and creative collaboration and offers hardware (in working condition and set up for use) from the 1970s, 1980s, and 1990s, including videogame systems, home computers, an arcade cabinet, and a workstation. Other resources include controllers, peripherals, manuals, books, and software on physical media. In reorganizing the space, we considered its primary purpose as a laboratory (rather than as a library or studio), organized materials by platform and intended use, and provided additional cues and textual information about the historical contexts of the available systems. I’ve noted here at MiT7 (Media in Transition 7) that we’re now achieved some very reasoned discussion and understanding of the virtues of different approaches to preserving and accessing computer programs. Not that we’ve solved the underlying problem, of course, but I’ve been pleased to see how our overall approach has evolved. Instead of simply dismissing emulation, migration, or the preservation of old hardware, we’ve had some good comments about the ways in which these different techniques have proven to work well and about what their limitations are. We saw this in the plenary discussion on archives and cultural memory late this morning – audio of that conversation will be coming online. Update: Here it is. Clara Fernandez-Vara’s presentation “Emulation as a Tool to Study Videogame History” [Abstract] developed this discussion extremely well with regard to one important tool, the emulator. She presented the idea of a game in emulation as facsimile – not the original edition, but also not the Cliff Notes that we’d have to consult otherwise. She showed us a range of work with emulators that gives reserach, teaching, and casual access to older games, which would otherwise be neglected. Saving state, speeding games up, and even playing several of them at once with the same inputs are all facilitated by emulators. Fernandez-Vara went on to note some limitations of emulation, such as that the physical controller, often significant to play, cannot be replicated in hardware; nor can particular hardware features such as those of the Dreamcast’s VMU or of a C64 floppy drive, which would whirr when something interesting was about to happen in a text adventure. Boxes and manuals are often very important and can’t always be effectively digitized; with online games and worlds, keeping the context is even harder. Finally, emulators have to be updated for new contemporary platforms every few years. Much of the work of building emulators, Fernandez-Vara also noted, is done by fans who work as volunteers – institutional support can help them and can allow libraries to accumulate holdings. It would be nice if current platforms (the PS3!) were more backwards-compatible, too. “Abandonware” could be officially made available for use, to clear up legal questions. The only thing I’d add to Fernandez-Vara’s excellent discussion is a slightly different framing perspective on the emulator. The emulated game may be usefully understood as a facsimile, but I see a different way to understand the emulator itself. My suggestion is that an emulator can be conceptualized as an edition of a computer. The first edition would be the original piece of hardware – for the Commodore 64, the August 1982 beige keyboard-with-CPU. Actually, in the case of the Commodore 64, even keeping to the United States there are at least three different “hardware” editions, since there are three ROM revisions, one used in very early machines, one in 1982 and 1983 computers, and one that was used in Commodore 64s and in the C64 mode of the Commodore 128. The three ROM revisions are not the only things that changed during the time the Commodore 64 was manufactured and sold, but they do change the behavior of the system. I suppose these better understood as being different “printings,” since the changes are limited to the ROM. That would be an interesting discussion to pursue. Either way, though, printing or edition, there are three different sets of hardware, three hardware Commodore 64s. When the creators of VICE (the emulator I use) produce a program that operates like a Commodore 64, I understand this as being an edition of the Commodore 64. Yes, it’s a software edition. It isn’t an official or authorized edition – only being a product of Commodore would allow for that. (There are official, authorized emulators, but this is not one.) It’s not, of course, the original and canonical edition. But it’s nevertheless an attempt to produce a system that functions like a Commodore 64, one which took a great deal of effort and is effective in many ways. Thinking of this an edition of the system seems to be a useful way to frame emulation, as it allows me to compare editions and usefully understand differences and similarities. And, there was one presentation on early microcomputing. Discoll began with the image of a book cover featuring a two-tier desk typical of HAM radio operation, declaring: “Hobby Computers Are Here!” He showed a response to Bill Gates’ famous “Open Letter to Hobbyists” and a clip from Revolution OS with an increasingly hysterical reading of the original letter – the dominant understanding of the letter today, as if it were the beginning of opposition to free software. Hobbyists learned to program on calculators and didn’t have contact with, for instance, the Internet protocol developers. In Interface, Art Childs (the editor) questions what software is and deals with many important issues in free software in replying to Gates’s letter. He concludes that a service model is best – just as GNU did later. This antecedent to free software has been overlooked, just as computer culture in much of the country (beyond Boston and Silicon Valley) have been overlooked. I was fascinated at these two different perspectives on the formation of the Internet (finding surprising non-technical discussion in RFC and surprising technical implications of a trade show) and on the difference between the culture of hobbyist computer builders, programmers, and users and that of those involved with the development and growth of the Internet. Driscoll’s more sensitive reading of Bill Gates’s “open letter,” Braman’s deep analysis of RFCs, and Kaman’s exploration and discussion of Interop provide great models for the understanding of computer histories. – Early Macintoshes have a green-on-black, all-caps display. – Interactive fiction text goes only 3/5 of the way across the screen. – Macs use 5.25″ floppy discs. These changes were no doubt thoughtfully made to construct the “retro” in a more intense way, allowing for a readable and seemingly old-school display and collaging different aspects of 1980s home computers. This way the green-on-black display and 5.25″ disks can live alongside the iconic presence of the early Mac. Plus, GLaDOS gets to say the multisyllabic word “Macintosh” at the end of the video. The creators of the video surely knew they were doing it wrong but decided to try to construct something more 80s than 80s. I wonder if they knew they were making a tribute video for Rob Swigart, whose game/novel Portal was released by Activision in 1986 on 5.25″ and 3.25″ disk for Amiga, Macintosh, Commodore 64, Apple II, and PC. Swigart also contributed to another early entry in the “pseudohacking” genre, the Activision game Hacker, which sported an all-text beginning that looked very much like the on-screen display in the video. The commercial testifies to our memories of the 1980s by making things up. But there was Portal on 5.25″ disk in 1986. This video documents the Amiga version. Interesting to see that the first commenter on there can’t believe that something like this could crawl out of our memory hole, through the portal from the past. You may have noticed a slew of posts on the Get Lamp blog, Taking Inventory, or seen the writeups on Boing Boing, PC Gamer, CNET, or other sites. But I’ll say it here too: Jason Scott’s documentary about text adventures, years in the making, is completed, has been pressed and assembled, and is now for sale and shipping. 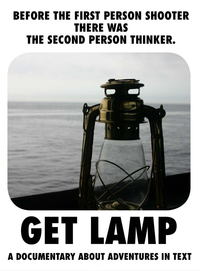 The movie is Get Lamp, and there is a trailer for it online. Tipped off by my book Twisty Little Passages: An Approach to Interactive Fiction, Jason Scott got in touch with me way back in 2005, before he had started filming interviews for Get Lamp. He came to Philadelphia, where I was working on my Ph.D. at Penn. I ended up doing one of several interviews with him there and bringing him to Autostart, a digital literature festival I helped organize at the Kelly Writers House, where he interviewed a few of the participants – just a handful of the many dozens of interviews Scott did for the documentary. I’ve gotten to see the documentary develop. I listened to audio files of the interviews, discussed the project on ifMUD, and got to see screenings of early versions with audiences at the Penny Arcade Expo East and @party. Get Lamp is an essential film for the interactive fiction enthusiast – as I think more or less all of us know already. It’s also going to be an important film for students of electronic literature or computing history. There are some good short YouTube videos explaining interactive fiction, such as Exploring Interactive Fiction, which I did with Talieh Rohani, and Jason McIntosh’s The Gameshelf #8: Modern Interactive Fiction. These are great for people whose interest has been piqued already and who want to know a bit more about IF history and how to play. But it’s really difficult to get contemporary, non-IF playing students to understand why they should give interactive fiction a chance. Those who put a few short games on a syllabus often return to classrooms of perplexed or disgruntled people who have made no progress. Screening at least the “non-interactive” cut of Get Lamp will be time well spent. It will provide ideas for discussion and will give students permission to appreciate interactive fiction in several new ways, allowing them to better engage with assigned games. Scott has done a great deal to provide coverage of today’s “modern era” of interactive fiction development while also covering its origins in Adventure, the ties that game has to caving, and the commercial heyday from Adventure International through Infocom. The history of the IF Comp is explained by current organizer Stephen Granade and others, and the emergence of short-form IF (and its relationship to the comp) is discussed as well. But the documentary’s perspective on interactive fiction clearly gazes longingly over the “golden age” of commercial IF, when Infocom was king. There’s the sense – which several people share – that interactive fiction has managed to continue in some ways from that time, which was its finest hour. That’s not the perspective some contemporary IF authors have, though. For some, Infocom is a happy but dim memory rather than the holy city of Byzantium. Others never even played an Infocom game before playing modern IF and writing their own IF. And of course, games are not just shorter now; they are written in a wider variety of styles on a wider variety of topics. It won’t be tough for enthusiasts to find other favorite aspects of IF which didn’t manage to fit into this full and rich documentary: the relationship to MUDs or the graphical adventure, commercial games in English outside the US, or global communities working on IF in recent years. Which is just to note that while Get Lamp relates an important and untold story, it’s not the _only_ story of interactive fiction. It’s the kind of movie that leaves me listening to my fellow IF authors and aficionados and being constantly surprised about how much I share certain people’s perspectives and how different, at other times, my view of IF is. That’s not just informative; it’s also thought-provoking. Yes, despite the breadth and unusual textures of the topic, the film goes beyond being a great introduction to IF and the people who play and write it. There are many surprising discussions outside the main line of IF history. The academic study of IF is discussed by Mary Ann Buckles, whose 1985 dissertation on Adventure is the first study of IF and probably the first long example of work in game studies. John Romero explains the debt that computer games in general owe to text adventures. Robert Pinsky, who has served as poet laureate in addition to writing the IF Mindwheel, discusses puzzles and the pleasures of literature. Other less-than-usual suspects chime in, including fellow academics and collaborators of mine Jeremy Douglass, Ian Bogost, and Stuart Moulthrop. One of my favorite points in the movie is when Brian Moriarty says empathetically of the Infocom catalog, “It was for literate people – it was for people who like to read!” Get Lamp is also for people who like to read, explore, and see from different perspectives. It’s not only for those who have already discovered interactive fiction, but it will delight most those who are enthusiastic about computing and what the computer can do with storytelling, language, and the modeling of words. Jason Scott is now preparing for a “Jet Lamp” tour in September, in which he’ll show the film around the country. Perhaps you’ll get to catch it at a theater near you. Just posted at ebr (Electronic Book Review) is Whitney Anne Trettien’s article “Computers, Cut-ups, and Combinatory Volvelles.” (We already love computers and cut-ups, but be aware that volvelles are extremely cool.) Some illustrations are still to come, but the article’s text and references are now up … I believe in link early, link often. The article is born of Trettien’s born-digital MIT Comparative Media Studies thesis “Computers, Cut-ups and Combinatory Volvelles: An Archaeology of Text-Generating Mechanisms,” a two-or-more-dimensional arrangement of reconfigurable texts. Like a conservative child reacting against his liberal parents, the ebr article is linear, but that should offer an helpful complement to the machinations of the thesis. The article reels back to long before the 20th century avant-garde to find recombinatory text machines and perspectives on reading that are relevant to the digital age. I highly recommend the ebr piece to those working with ergodic texts and operating today’s textual computer machines. It will hopefully serve as a nice gateway drug, too, interesting more readers in Trettien’s combinatory thesis. Francisco J. Ricardo of RISD’s Digital+Media Department has written a deep and detailed blog post, “From Objecthood to Processhood.” In it, he defends artists, their work, and their discourse about the digital, responding to Henry Jenkins’s 2000 article “Games, the New Lively Art,” which celebrates video games but isn’t as keen on the work of artists. He also describes the transition from a focus on the artwork, an object, to consideration of art as process, concluding with reference to my ppg256 series. Also, a rather innovative defense of BASIC is advanced in “Where Dijkstra went wrong: the value of BASIC as a first programming language,” a post by Mike Taylor, who, by the way, has a totally sweet banner at the top of his blog. Edsger W. Dijkstra, who was my teacher at the University of Texas, is known for his work on structured programming and just about as well known for his quick denunciations of COBOL and BASIC. The post argues that BASIC is useful to programmers and allows them to discipline their thinking about programs. I would defend BASIC for a different, although not inconsistent, reason: The huge outpouring of innovative, diverse, creative programs – often very short ones – that were written in the 1970s and 1980s, making programming a widespread activity and showing people the potential of the computer for (among other things) amusement, simulation, play with language, and production of visual art. Noah Wardrip-Fruin and I wrote a bit more on this back in 2003 in our introduction to two BASIC programs on The New Media Reader CD-ROM. This is a clear explanation, but it raises the question of how this particular nonsense word came into wide use at MIT. It seems reasonable to pursue this question, and reasonable that there would be some discernable answer. After all, there’s a whole official document, RFC 3092, explaining the etymology of “foobar.” It could be interesting to know what sort of nonsense word “zork” is, since it’s quite a different thing, with very different resonances, to borrow a “nonsense” term from Edward Lear or Lewis Carroll as opposed to Hugo Ball or Tristan Tzara. “Zork,” of course, doesn’t seem to derive from either humorous English nonsense poetry or Dada; the possibilities for its origins are more complex. Zork, by the way, was never really named. “Zork” was a nonsense word floating around; it was usually a verb, as in “zork the fweep,” and may have been derived from “zorch.” (“Zorch” is another nonsense word implying total destruction.) We tended to name our programs with the word “zork” until they were ready to be installed on the system. “Zorch” is listed in Peter R. Samson’s 1959 “TMRC Dictionary” – the dictionary of the Tech Model Railroad Club, an organization that was important in helping to begin and foster recreational computing. The term meant, at that time, “to attack with an inverse heat sink” – that is, to attack with a heat source – and is explained as “Another of David Sawyer’s sound effects, which I reinterpreted as a colorful variant of ‘scorch. '” It could also be imagined as a variant of “torch” – either way, the application of heat is suggested. This definition is consistent with the sense of “zorch” that Anderson gives, although a bit more specific. It is quite possible that “zork” does derive from “zorch,” as Anderson and others guess, but it is not clear why a word so derived would then be used as a placeholder program name. It’s also at least arguable that “zork” sounds less destructive than “zorch,” as the unintimidating back-formations “scork” and “tork” suggest. If that’s the case, why would a less intense term come to be used when the original term is more intense and very comical? 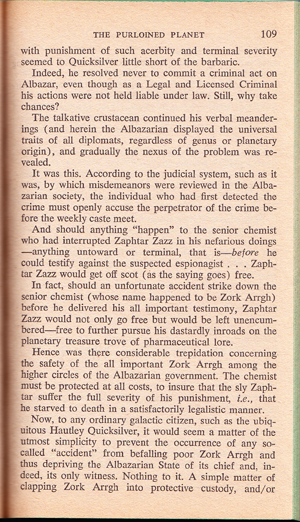 While the “zorch” etymology might be right, it at least seems worthwhile to look to other possibilities. “Zork” occurs occasionally, although rarely, as a proper name in various print sources in the decades leading up to 1977. Google Book Search reveals that some more nonsensical uses occur in some textbook examples in the 1970s. In Introduction to Experimental Psychology by Douglas W. Matheson, Richard Loren Bruce, and Kenneth L. Beauchamp (1970, 2nd. ed 1974) the meaningless “zork” model is introduced as a contrast to a medical model. “Zork” is also used as a fictional place name in Henry F. DeFrancesco’s 1975 Quantitative Analysis Methods for Substantive Analysts. There is some chance that the term was picked up from such a source. Zork explicitly pokes fun at the material nature of textbooks by including a “this space intentionally left blank” joke, which refers to a message sometimes printed on textbook’s blank pages to let readers know that they have not been left blank due to a printing error. Given this, it would be hard to rule out to possibility of the term “zork” coming from a textbook. Of course, the term could have appeared at MIT indirectly, in an example given in a lecture, on a problem set, or on a test, even if a book with the example in it was not assigned as a text. But there is nothing to strongly recommend this etymology, either. And while the former textbook example is clearly the more vivid, it is also much less likely to have been encountered by the Zork authors, [updated January 10] since they were involved with a computer science research group, Dynamic Modeling. MIT does not now have a department named psychology, but Course 9 (now Brain and Cognitive Sciences) was called Psychology from 1960-1985. There has been some speculation – specifically, in this mailing-list thread – that the term “zork” may come to MIT via John Brunner, whose poetry chapbook A Hastily Thrown-Together Bit of Zork was published in 1974. 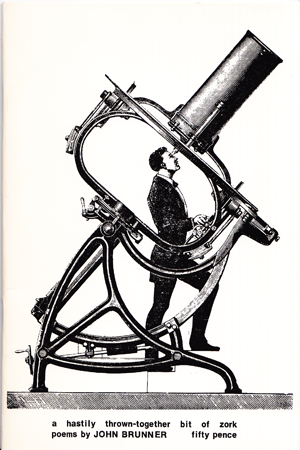 Although the sense of the word as it appears in the title is completely consistent with the MIT meaning of the term, it is not clear that this 24-page pamphlet, published by Square House Books in an edition of 200 (50 numbered and signed), had made it to MIT by the time Zork coalesced, beginning in 1977. Nevertheless, the idea of a science-fictional vector for the term is appealing. 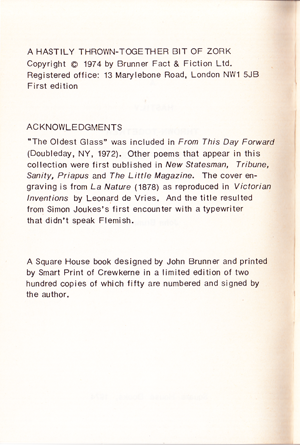 On the unnumbered second page of A Hastily Thrown-Together Bit of Zork, Brunner notes that “the title resulted from Simon Joukes’s first encounter with a typewriter that didn’t speak Flemish.” According to this history of Dutch and Flemish fandom, Simon Joukes was active in Flemish fandom and was a part of the club Sfan, helping to publish Info-Sfan, which became SF Magazine. It’s particularly appealing that this etymology makes zork an altered form of, or an alternative to … work. It’s likely that Brunner at least glanced at the name of this key character. 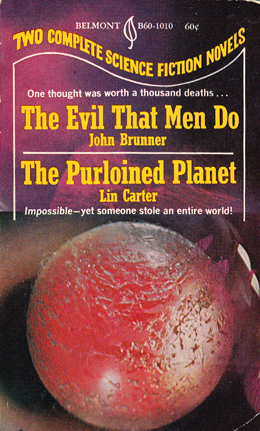 Lin Carter’s novel was published in a Belmont Double edition with “two complete science fiction novels.” The other was Brunner’s The Evil That Men Do. While Simon Joukes may have typed out the word “Zork” and directly inspired Brunner’s 1974 title, the word may have rang out to Brunner as interesting and particulaly amusing because of Carter’s earlier use of it. There is some chance that people at MIT saw Brunner’s slim book of poems, but it seems far from certain. As of this writing, WorldCat lists only four university libraries in the United States that have this limited-edition book. MITSFS, the MIT Science Fiction Society, boasts the world’s largest open-stack library of science fiction and has 83 titles by Brunner in its catalog – but A Hastily Thrown-Together Bit of Zork is not among these. The Evil That Men Do / The Purloined Planet is in the collection, however. Even when all of these additional leads are considered, it seems there is no strong conclusion to be drawn about the deeper etymology of the name of MIT’s, and Infocom’s, most famous text adventure. “Zork” might have been a corruption or further development of “zorch.” It may have entered the argot because of its use in an amusing curricular example, perhaps thanks to Quantitative Analysis Methods for Substantive Analysts or another textbook that hasn’t yet been ingested into Google Books. Or, science fiction may have been the vector for the word. If it was, though, it seems likely that it made its way into MIT speech not because of Brunner’s book of poems, but thanks to Zork Arrgh, a key character in 1969 novel by Lin Carter, one that was sitting on the shelves at MITSFS. Perhaps more evidence will come to light, and the origins of the word “zork” as it was used at MIT in the late 1970s will become clear. Or, it may be that the origins of the word are lost forever – obliterated in a nook of a subculture’s linguistic history that has been irreversibly zorched. Talieh Rohani made a video of about six minutes in which I discuss the basics of interactive fiction and show a few artifacts related to the material history of this form of computer game and digital literature. This video, “Exploring Interactive Fiction,” was made for the recent Jornada de Literatura in Passo Fundo, Brazil, and a subtitled version was screened there. I’m a few months late in putting it on the Tube for anyone else who is interested, but it’s online now. Also, a short interview with me about interactive fiction and computer games is online at RPG Examiner. Thanks to Michael Tresca for his interest, his questions, and for posting the interview. In 2007, Pat Harrigan and Noah Wardrip-Fruin’s collection Second Persion was a finalist, so we’re not breaking any ground here for digital media studies or MIT Press. But it’s nice to be selected by the folks at Game Developer.